I know it’s tempting, but right now is not the time to flee from stocks to cash. Markets are extremely oversold and due for some sort of relief rally (at least). Liquidate now and we’re no better than the average investor who underperforms by selling low after buying high. Plus by collecting our dividends we’ll soon outpace the investors who smartly (or more likely, luckily) sold in September. Here’s why. 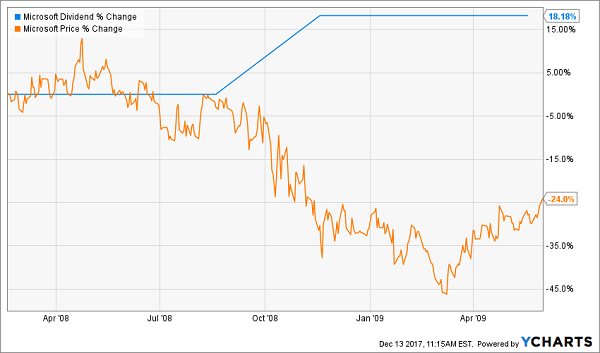 Studies show it’s very difficult (and really, impossible) to know when it’s time to “get back into stocks.” Hulbert Financial recently ran the numbers for Barron’s on the advisors it monitors. It focused on the best “peak market timers” – the gurus who correctly forecasted the bursting of the Internet bubble in March 2000 and the Great Recession in October 2007. These were the clairvoyant advisors who had their clients out of stocks and mostly in cash as the S&P 500 was about to be chopped in half. Surely their clients did great over the long haul, given their capital was largely intact at the market bottoms, right? Wrong. None of these advisors turned in top performances. The reason? While they were good at timing tops, they were terrible at timing bottoms! The bearish advisors didn’t get their clients back into stocks anywhere near the bottom. They had their capital intact, but they didn’t deploy it – and they largely missed out on the epic bull markets that ensued these crashes. 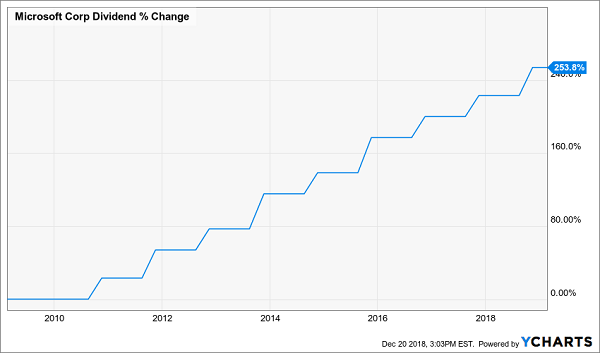 The 4% Fallacy Says Sell This Chart – But Why? Remember dollar-cost averaging, which you likely used to build your nest egg? Selling now utilizes the same phenomenon but in reverse! In this scenario, you’re selling more shares when prices are low and fewer when prices are high. It’s a straight path to prematurely running down your savings. But don’t despair, because there’s an easy solution: build a retirement portfolio with an outsized dividend yield. I’m talking an 8%+ average payout or better. That’s enough to live on dividends alone with as little as $500,000 saved up. 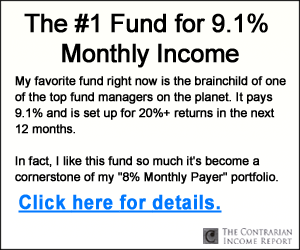 Pull up our Contrarian Income Report portfolio page, close your eyes and point to your computer screen. The stock or fund you selected “blindfolded” likely yields 8.9% or so. That’s enough to retire on! These dividends will generate $89,000 on a million dollar portfolio, and $44,500 on the $500K I mentioned. For most folks this is enough cash to ride out these types of storms without having to sell off spare parts from your retirement boat. You’ll miss out on the long-term gains only the stock market can offer. So why not blend a portfolio of 8%+ bond funds with smart stock picks that provide you with similarly high yields with upside to boot? Sure, they may “sell off” a bit if the markets pull back. But who cares. Like a savvy rich speculator, you’ll be able to step in and buy more shares when they are cheap – without having to worry about your next capital withdrawal. Let’s take healthcare landlord Omega Healthcare Industries (OHI). 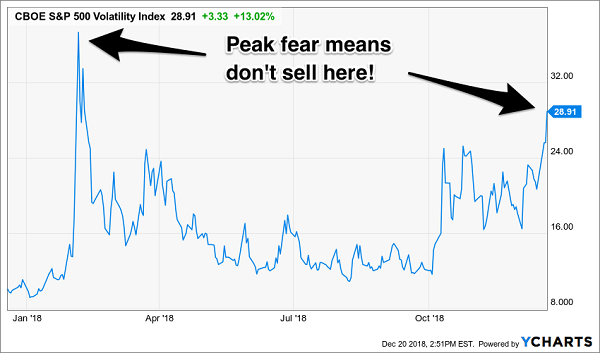 The firm’s payout is usually generous, and always reliable – yet, for whatever reason, its sometimes manic price action gives investors heartburn. 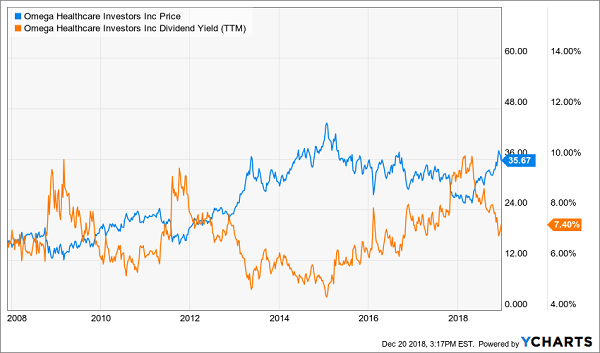 When the stock’s yield is high (orange line), its price is low. Investors should buy here. When the stock’s price is high (blue line), its yield is low. Investors should hold here and enjoy their dividend payments. Of course this simple timing strategy is much easier to employ if you don’t need stock prices to stay high to retire. Most investors who sell shares for income spend their days staring at every tick of the markets. You can live better than this, generate more income and even enjoy more upside by employing our contrarian approach to the yield markets. We live off dividends alone. And we buy issues when they are out-of-favor (like right now) so that our payouts and upside are both maximized. Getting paid monthly to boot! If this interests you, I’d recommend starting with my all-star retirement portfolio. It contains 8 of the absolute best preferred stocks, REITs and CEFs out there. If you’re scratching your head at these terms, you’re not alone. These are investments that you won’t hear about on CNBC or read about in the Wall Street Journal. Which is why we have these fantastic opportunities available in this “no yield” world. I’ll explain more about them in a minute. I’ll also show you why my 8% eight-pack is well diversified across all types of investments and sectors, and the cash flows funding these dividends will do well no matter what happens in the broader economy or stock market. Plus, as I hinted, relentless dividend growth means your 8% yield will be more like 10% in short order. 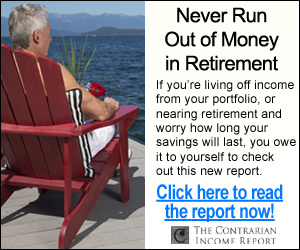 I’m ready to take you inside this “no-worry” retirement portfolio now. Click here and I’ll show you the 8 bargain investments inside it and give you their names, tickers, buy-under prices and much more!